For those who love… Berries! For those who love… Berries is the ideal package for those who do not want to give up the typical fresh tastes of the autumn season. 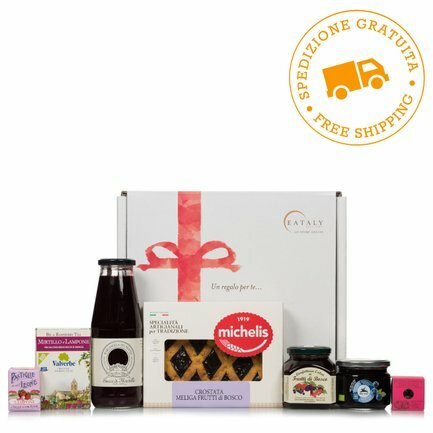 In this kit you will find: Chocolate-covered raspberries 60g from T'A Milano; Blueberry and Raspberry Tea, 20 filters from Valverbe; Raspberry hard candies 30g from Leone; Blueberry compote 270g from Alce Nero; Blueberry juice 270g from Mariangela Prunotto; Berry Pie 340g from Michelis; Berry Extra Jam 350g from Dalpian. If you feel like giving someone or giving yourself the best of berries in a wide range of formats, this package is the perfect choice. Take advantage of the free shipping. Bilberry and Raspberry infusion 20 bags:Rose hip berries, strawberry leaves, Elder berries, hibiscus flowers, bilberry berries 10%, bilberry leaves 8%, raspberry leaves 3%, natural raspberry flavouring 4%. Lampone Ricoperto di Cioccolato Fondente 60g:Chocolate cover: cocoa paste, sugar, cocoa butter, emulsifier: soy lecithin, natural vanilla flavor. Cacao 66% min. Fruit Heart (21.7%): Fruits (40% concentrated apple puree, apple juice 33%, raspberry puree 25%, concentrated elderberry juice 1%), gelling agent: pectin, citrus fiber, aroma natural raspberry. It can contain traces of milk, nuts, gluten, eggs, sesame and peanuts. Raspberry Pastilles 30g:Sugar. Thickening agents: gum arabic, tragacanth. Raspberry juice, flavourings. Acidifier: tartaric acid. Coloured with cochineal. 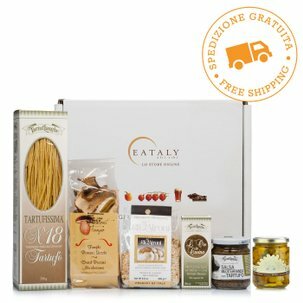 This box contains: T'A Milano; Valverbe; Leone; Alce Nero; Mariangela Prunotto; Michelis; Dalpian.